I have been tracking the real estate slowdown from two different sources of real estate information. 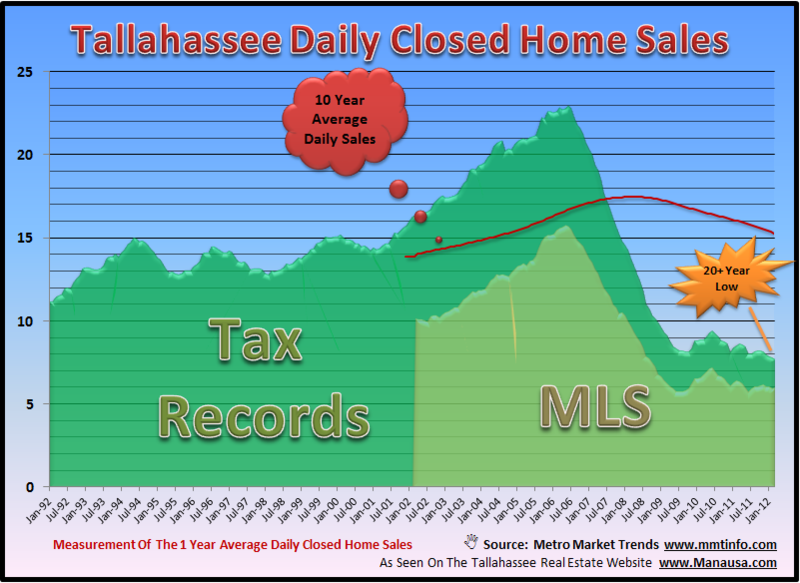 The Tallahassee MLS provides the only real source of information where the current rate of demand can be compared with its relative supply of homes for sale, and we need this to identify the scope of the real estate slowdown. The Leon County Property Appraiser maintains a database of all recorded transactions in Tallahassee, thus it includes everything in the Tallahassee MLS plus sales that were never entered into the Realtor home marketing system. So the Realtor MLS does not contain information on all of the home sales in Tallahassee. In any given year, the MLS might contain as much as 80% of the home sales in Tallahassee, but as few as 45% of the sales. Thus, to really understand the trends occurring in the entire market, I feel compelled to review all closings in Leon County in order to know that what is happening outside of the Tallahassee MLS is consistent with what all Realtors are seeing. In the graph above, the light green record of home sales in the MLS shows that we are currently “near” the bottom set in 2009. But a closer look at the dark green record of “all” home sales (from the Leon County Property Tax Appraisers database) shows that we actually have hit a new low two months ago and are still heading further down right now. The red line shows our current rate of 7.7 closed home sales per day is 49% lower than the ten year daily closed home sales average of 15.2 per day. So when I report that our market is running at about 50% of its "normal" rate, it is this information that has given me the confidence to make that statement. So here's the thing on the real estate slowdown. Realtors have been taught to "be optimistic" and to bring consumer confidence along through big smiles and positive attitudes. While I am optimistic for the long-term values of real estate, I believe that it is a disservice to homeowners who are making poor choices with this falsified real estate market intelligence. If you have a home to sell, you can count on getting my honest assessment of the current market, and how to use that information to your best advantage. Just drop me a note to get the lowdown on the real estate slowdown, and you will be able to make the best decision possible for you and your family.